Someone forgot about the fruit salad. When the refrigerator door opens, the sickly sweet aroma delivers a potent reminder. All the rotting apples, pears, and bananas in the bowl will need to be thrown out, and hopefully composted. It may seem insignificant, but that fruit salad represents a piece of the 40 percent of food wasted in the United States, about 20 pounds per person each month. In recent years, food waste in this country and many other places around the world has grown not only in volume, but also in the collective consciousness. The numbers are staggering. Americans throw away an estimated $165 billion worth of food each year. 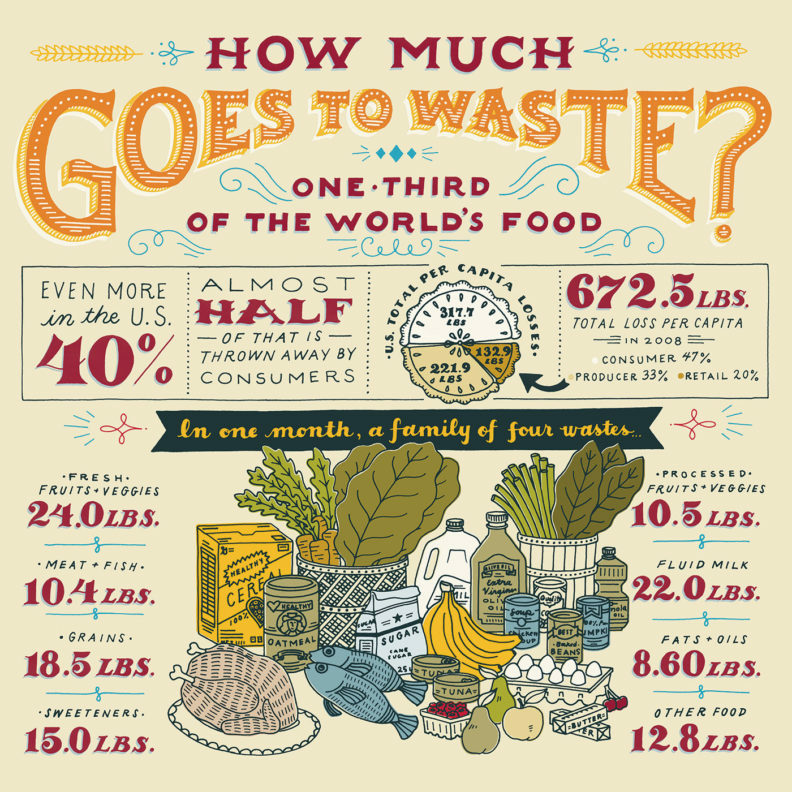 Uneaten food is the single largest item in landfills, creating huge amounts of methane. If even 15 percent of that wasted food were redirected, it could feed 25 million Americans a year, a boon for people who live with hunger. The last decade has seen increasing efforts to bring greater attention to the problem, as well as spur on creative solutions to reduce food waste from farm to fork, throughout the food supply chain. Ideas like dumpster dinners in New York and San Francisco using entirely recovered foods, gleaning projects to gather produce that would otherwise rot away, and better understanding of “best by” dates on food packaging, all can help move toward the Environmental Protection Agency’s goal of reducing food waste in half by 2030. Here in Washington, experimental programs at schools, Washington State University dining halls, and industrial food processors are exploring ways to boost nutrition, reduce waste, and help people without enough food. WSU bioengineers are developing healthier ways to preserve food longer without chemical additives. And, community volunteers are teaming up with county Extension offices to find safe and effective ways to steer uneaten food away from landfills and to those who most need it. “While it really is a national conversation, I see WSU as a natural leader in the state in this field because of Extension and research on composting, food recovery, food safety, and everything in this food waste picture,” says Meggan Uecker, a former Extension agent now with Clallam County. The apples in the now-defunct fruit salad could have been used earlier, at least in juice. Approximately 20 percent of fruits and vegetables are lost in production, but apples fare slightly better thanks to groups like the Tree Top cooperative. Started in 1960 by William Henry Charbonneau in Selah, Tree Top transforms cull apples—fruit rejected for its size, shape, or color—into juice, sauce, or other value-added products. Prior to Tree Top’s inception, giant piles of apples would often rot on the ground, costing orchardists millions of dollars in lost product. In Tree Top: Creating a Fruit Revolution, published by WSU Press in 2010, emeritus history professor David Stratton wrote that the Tree Top grower cooperative began to see profit from fruit that otherwise would have not only been wasted, but could cost them up to $5 a ton to get hauled away to rot. Charbonneau’s introduction of frozen concentrate juice further increased the market for the processed apples. 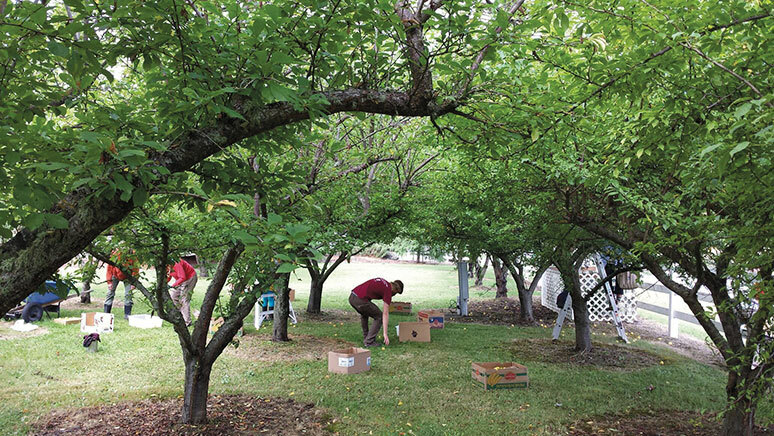 Tree Top expanded beyond apples to pears, berries, and other fruits as the orchardist-owners saw their bottom lines improve from the cull. Stratton wrote that, in addition to apple juice and cider, Tree Top distributes consumer packaged goods, such as fresh apple slices, blends with other juices, and apple sauce in 30 states. The more than 1,000 growers of Tree Top processed over 600 million pounds of apples last year, making it the single-largest user of Washington state apples. The cooperative provides ingredients to 22 of the world’s 25 leading food and beverage manufacturers, and it is the largest supplier of dried apple products in the world. The Tree Top apple sauce could very well end up in a Yakima school a few miles away. Unfortunately, the apple sauce may end up in the garbage can, a result that Ethan Bergman would love to avoid. He considers himself a pediatric nutritionist, interested in how we can improve foods in schools, as well as ensuring kids get enough to eat. A former president of the Academy of Nutrition and Dietetics, Bergman has studied school meals for 21 years. When Bergman was researching school lunch waste at four low-income Yakima elementary schools, he was dismayed to see the garbage cans filled with green and white from broccoli and cauliflower tossed from the trays. At those schools, he found students wasted 25 to 40 percent of their food, even though most students qualified for free or reduced lunch. Bergman would love the students to eat better and waste less, and a couple of changes in school policies would help. First, having lunch periods after recess rather than before decreases wasted food—those kids get hungry after running around. Another idea is to increase lunch periods even a few minutes more, to allow children to eat the food. “If you assume you have a school lunch that’s nutritious, how do you get that school meal inside a student as opposed to having them throw it away?” asks Bergman. On the WSU Pullman campus, Adam Koerner also wants to keep food waste to a minimum. At WSU Dining Services, executive chef Koerner oversees an operation that delivers 5,000 to 10,000 meals a day. He and Sarah Larson ’87, associate director of Dining Services, know that careful planning is the first step in sustainability. “We have business practices in place to minimize food waste in the first place, forecasting and being smart about how we run the business,” says Larson. Koerner says Dining Services has used databases for over 30 years for meal planning and to hone in on changing tastes of students. They are also trying more on-demand cooking in the dining halls. Despite their most diligent efforts, though, Koerner and Larson know there will always be some extra food. “Our main goal is to have zero waste, but that’s really hard in food service,” says Koerner. Dining Services is exploring a partnership with the WSU Center for Civic Engagement, Food Recovery Pullman (a registered student organization focused on food recovery), and the Whitman County Community Action Center to safely recover certain unserved foods for people who need it. For example, says Larson, “if we have a quarter of a pan of lasagna, we might want to donate that.” Koerner adds that extra bread or produce could be redirected to the Community Action Center. The pilot program is set for this spring as part of the EPA Food Recovery Challenge, and could expand to other food service businesses in the community. “All the work that’s being done on our end will open doors for other restaurants in the area to be part of this,” says Koerner. It’s a great way to connect with the needs of the community. “We repurpose our meals and leftovers where we can, and now we can get the excess to the community,” says Larson. Large food service organizations like WSU Dining Services and school cafeterias often rely on preserved foods to supplement fresh material. But the old stereotypes about canned green beans and tasteless peaches don’t encourage eating more and reducing waste. Those ideas could get dispelled with the advent of new ways developed at WSU to preserve food longer, with better quality and aesthetic appeal. Juming Tang, a Regents professor in the Department of Biological Systems Engineering and distinguished chair of food engineering, spent over 20 years exploring one of the trickiest puzzles of food preservation: how to use the rapid heat of microwaves to sterilize food without ruining the product. In the 1970s, the U.S. military had researched microwaves as a way to preserve food, followed by food industry studies in the 1980s. “They all failed badly,” says Tang. When he arrived at WSU, Tang’s department chair Ralph Cavalieri challenged him to investigate long-term, high-risk areas in food science, so he tackled the microwave preservation problem. Tang’s research started primarily as a way to improve shelf-stable rations fed to military personnel in the field. His work led to microwave-assisted thermal sterilization (MATS) about thirteen years later. The MATS system sterilizes with a pressurized hot water bath that delivers heat externally, but then uses a patented microwave energy system to heat the package internally, using a low frequency of 915 MHz, before the package is rapidly cooled. Since temperatures are raised quicker than other systems, it kills microorganisms while minimizing food damage. Normal shelf life expectancy of microwave-sterilized products prepackaged in plastic containers or pouches is two years or longer. It also reduces salt and eliminates preservatives. Tang received two patents for the technologies to produce prepackaged, low-acid foods, one in 2006 for sterilization and the other in 2011. MATS is the first microwave technology accepted by the U.S. Food and Drug Administration for in-package sterilization applications. Microwave sterilized foods can be stored at ambient temperatures and reheated in a household microwave. Eliminating product freezing and thawing also reduces energy use while it improves meal quality. There’s no need for preservatives to extend shelf life, a bonus for health-conscious shoppers reading food labels. A similar technology recently developed in Tang’s laboratory, microwave-assisted thermal pasteurization (MAPS), is used to prepare refrigerated ready-to-eat meals. The result is pathogen-free and high-quality products, such as deli meats, that can last up to eight weeks in the refrigerator, as opposed to a week or so. “This gives the consumer plenty of time when they want to use it at home, or in cafeterias,” says Tang. Tang says food waste has become very prominent in discussions within his field and the industry. The preservation methods he developed could reduce spoilage and foodborne illnesses, particularly with meat and prepared foods, and thus less waste. The MATS and MAPS treatments at WSU have produced salmon fillets, macaroni and cheese, mashed potato and beef in gravy, among other “ready-to-eat meals”—frozen, refrigerated, or shelf-stable entrees sold at retail markets and used in institutions. WSU hosts boot camps for product developers and food technologists of food companies, as well as chefs and other food service professionals, to learn the science and try out their own recipes. 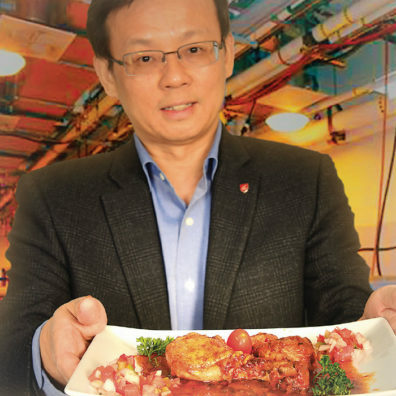 They’ve developed lobster, pasta, and other restaurant-quality dishes that will last for weeks thanks to Tang’s microwave techniques. Tang worked closely with research institutions affiliated with the U.S. Department of Defense and the Australian Department of Defense, and the NASA Johnson Space Center Food Laboratory. His patents led to the formation of 915 Labs, a company that is designing industrial systems for companies worldwide. Tang thinks it might be one to two years before we see high quality meals produced by WSU technologies in markets. While Tang’s recent innovations certainly perform technological wonders to preserve food longer and better, WSU Extension has a history of food preservation. Extension bulletins from almost a hundred years ago outline steps for home gardeners and cooks to prevent food waste through canning. Now, Extension does more than offer canning tips. 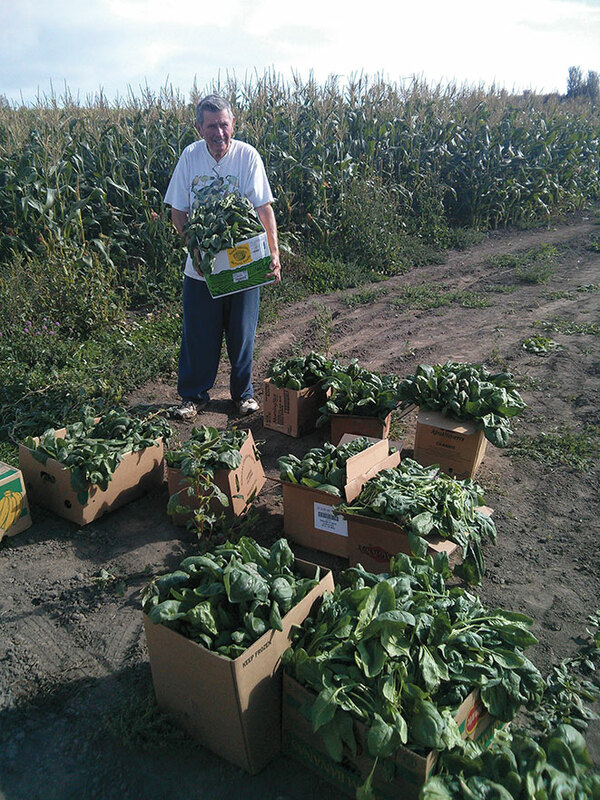 Staff members work within their counties and communities to reduce food waste through gleaning and other food recovery programs to redirect vegetables and fruits to food banks and people without enough food. They also lead education efforts about food waste and ways to mitigate it. 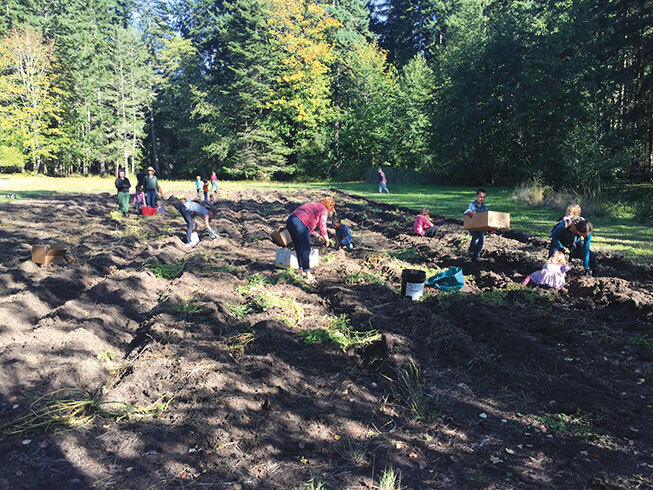 In Clallam County, for example, Extension agents work with a cadre of volunteers, farmers, food banks, and schools on food recovery efforts. Clea Rome, director of Clallam County Extension, says their office wants to connect farms to food banks. “Extension is a unique spot to connect different aspects of the food system and make it more equitable through food recovery,” she says. Uecker, who worked with Clallam County Extension and recently moved into the county’s solid waste office, says the food waste reduction effort there got a boost from a state Department of Ecology grant a few years ago. “These programs are funded on a shoestring budget, but we’ve made some great inroads on food recovery for a small county. We have to get creative,” says Uecker. That includes gleaning, food processing, and other plans to reduce food going into the landfill. The grant also allowed Rome to hire Dan Littlefield from VISTA AmeriCorps through its Harvest to Hunger program. He and Karlena Brailey, a nutrition coordinator for Clallam County Extension, joined Uecker in the food recovery work. The gleaning has had substantial effect. Brailey recently gave away 2,500 pounds of locally gleaned apples and pears to families in the Port Angeles School District. She’s also conducting a pilot project to turn some of those gleaned apples into apple sauce, which will be distributed to clients at meal sites and food banks. Brailey and Littlefield continue to cook up ideas for food recovery and educate residents of Clallam County, such as developing recipes with the high school culinary club to conserve gleaned foods. “Food conservation is the most effective way to combat waste. I would love to see it hand in hand with composting,” says Uecker. So, that fruit salad is a lost cause for dinner. There is something that can be done, though. The final step to keep food materials from landfills should be composting. Like other forms of waste, uneaten food is out of sight, out of mind for many people when it ends up in the trash. But organic matter breaking down in landfills accounts for 16 percent of methane emissions in the United States, according to a 2012 Natural Resources Defense Council study. The potent greenhouse gas contributes significantly to climate change. A United Kingdom study claims that removing food scraps from landfills would be the equivalent of taking one-fifth of the cars off the road there. 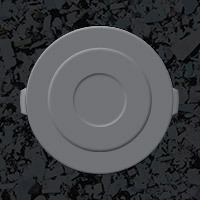 Composting at the home, municipal, and industrial level could alleviate the problem. Unlike recycling rates, which have consistently risen, only about 2.5 percent of Americans compost food waste. According to a state Department of Ecology 2009 waste audit, over 30 percent of the state’s garbage was compostable material, including compostable paper and natural wood. The first step to improve the numbers is to show the benefit of composting at home. Compost can help build healthy soil and plants. It reduces the need for garden chemicals, and the soil retains moisture longer—so less watering. Researchers at WSU Puyallup have evaluated effects of compost applications on nitrogen availability and soil properties. They note that it may be more useful for improving long-term soil quality and nutrient supply, while stabilizing organic waste materials They train compost facility operators, while Extension offices also deliver composting information and a number have a volunteer Master Composter program to complement their Master Gardener efforts. Koerner adds that many of the students coming to college already have composting in mind, particularly with Seattle mandates to reduce food waste. It’s an educational process as well. A survey by the International Food Information Council reveals that one-third of Americans say they “don’t create any food waste.” If people are to become aware, they’ll also want to know how to reduce food waste. Since its beginning, Extension has played a role of educating Washingtonians and spreading scientific knowledge. Any movement toward reduction of food waste will require that education, as well as a suite of solutions from the field to the kitchen. The refrigerator will be slightly less stinky without the moldy fruit salad. It’ll turn into fine composted organic material to grow more vegetables. It’s equally important, however, as a symbol of the new recycling and increasing consciousness of our food waste problem.